Microsoft Teams is a chat-based workspace that brings together people, conversations, content, and tools for easier collaboration. 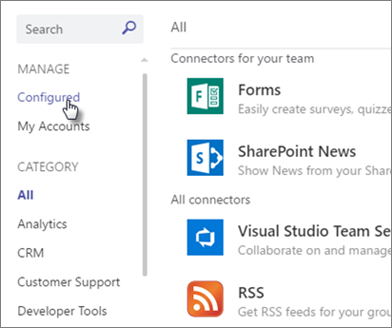 When you create a Team, you create or connect to an existing Office 365 group, and the group gets a SharePoint team site. 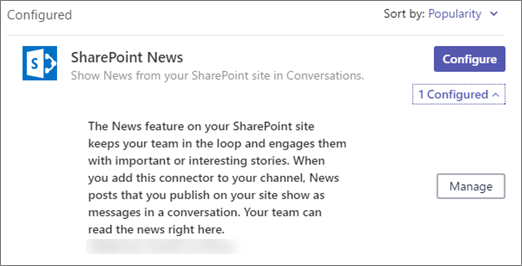 SharePoint team sites include the News feature, which allow you to keep your team in the loop as well as engage them with important or interesting stories. 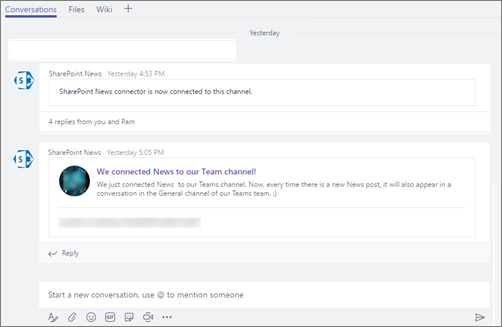 To further enhance collaboration, you can configure a Microsoft Teams channel that is associated with your team site to automatically show news posts from your team site as part of a channel conversation. Some functionality is introduced gradually to organizations that have opted in to the Targeted Release program. This means that you may not yet see this feature or it may look different than what is described in the help articles. 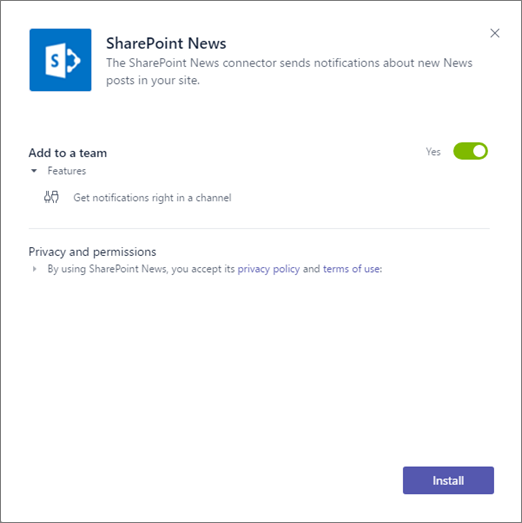 This feature uses a SharePoint News connector. You must have an Exchange Online license to use any connector. In Teams, navigate to the team and channel where you want messages about your news posts to appear. Optionally, you can create a new channel for your posts. For information on how to do this, see Teams and channels. Note: The team channel to which you want to publish news posts must be associated with the team site where your News posts are published. Click the ellipses (...) to the right of the channel name, and then click Connectors. Find SharePoint News, and then click Add. If you don't see SharePoint News, search for it using the Search box on the left. That's it! Now, every time you publish a news post on your team site, a notification will appear as part of the conversation in your Teams channel. In Teams, navigate to the team and channel where you want to remove the News feature. Find SharePoint News, click 1 Configured, and then click Manage.